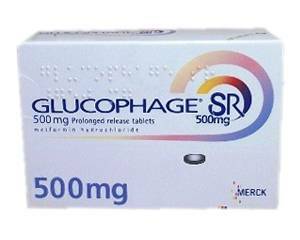 Glucophage is used to help control blood sugar levels in people with type 2 diabetes. It reduces the symptoms that are caused by high blood sugar and, by doing so, prevents damage to the body. If you would like to order Glucophage online, Dokteronline.com’s partner pharmacies will be happy to assist you. Type 2 diabetes is a form of diabetes that develops when the liver and muscles become resistant to insulin. As a result the pancreas needs to produce more insulin than it would normally need to. If the pancreas can no longer produce enough insulin to bring down sugar levels, the body cannot break down the sugars that are in the food that we eat. This causes blood sugar levels to rise and as a consequence the symptoms of diabetes (thirst, dry mouth, increased need to urinate and fatigue) will begin to appear. In the long term, high blood sugar can damage blood vessels and organs. As time goes on, this damage causes serious complications. Glucophage decreases the amount of sugar (glucose) in the blood. It reduces the symptoms of diabetes and so minimises the chance of complications. Glucophage can be ordered online via one of Dokteronline.com’s partner pharmacies. Glucophage is available in various strengths. The doctor will recommend the right dose for you. Glucophage tablets should be taken either during or just after meals. Taking the tablets with food reduces the chance of stomach distress. Glucophage tablets should not be chewed, but swallowed whole with some water. Adults: one 500-mg or 850-tablet tablet two to three times a day, with a maximum of 3000 mg a day, divided in three doses. Children aged 12 to 18 years: one 500-mg or 850-mg tablet once a day, with a maximum of 2000 mg a day, divided in two to three doses. Consult a doctor if these or other side effects are severe. For more information, see the package leaflet. Consult a doctor on the use of Glucophage if you have a health condition that is not listed above. It is also important that you tell the doctor what other medicines you are currently taking. This is to avoid potential interaction and to make sure that the combination with Glucophage is safe. For more information on contraindications, interactions and warnings, see the package leaflet. Do not use Glucophage if you are pregnant or breastfeeding without consulting a doctor first. Glucophage may cause eye problems (e.g. blurred vision due to low blood sugar). Stay out of traffic if your vision is impaired. You should avoid drinking alcohol while you are taking this medicine, as it can increase the risk of serious side effects such as lactic acidosis.